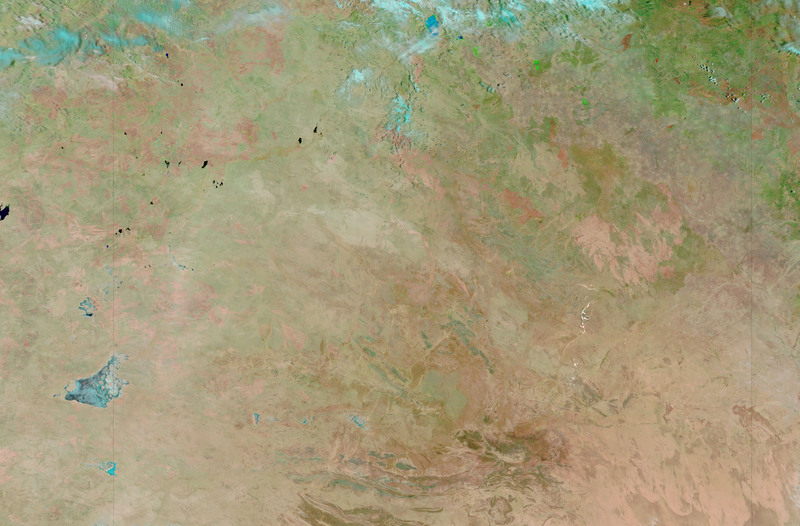 Normally dry, Australia’s desert interior blooms under the influence of the summer monsoon. In mid-January, a monsoon storm drifted slowly across Australia’s Northern Territory, into South Australia, and on January 22, into Queensland. The storm dumped heavy rain on the desert and left flooding in its wake. 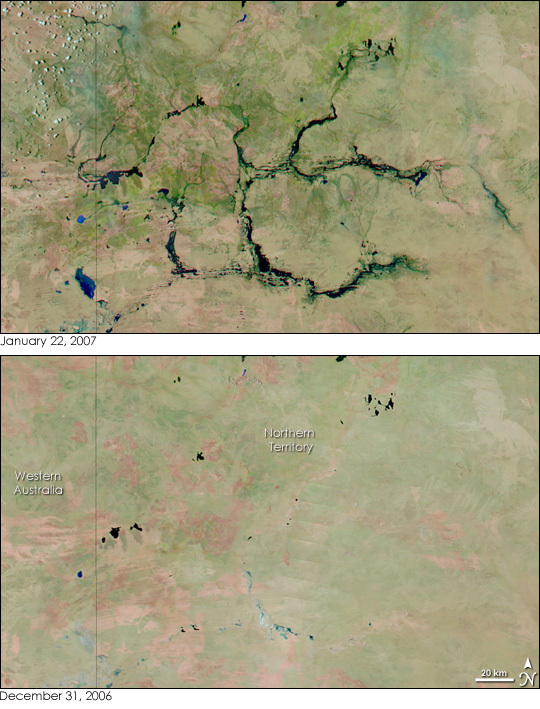 The top image of floods in Northern Territory was captured on January 22, 2007, by the Moderate Resolution Imaging Spectroradiometer (MODIS) on NASA’s Terra satellite. 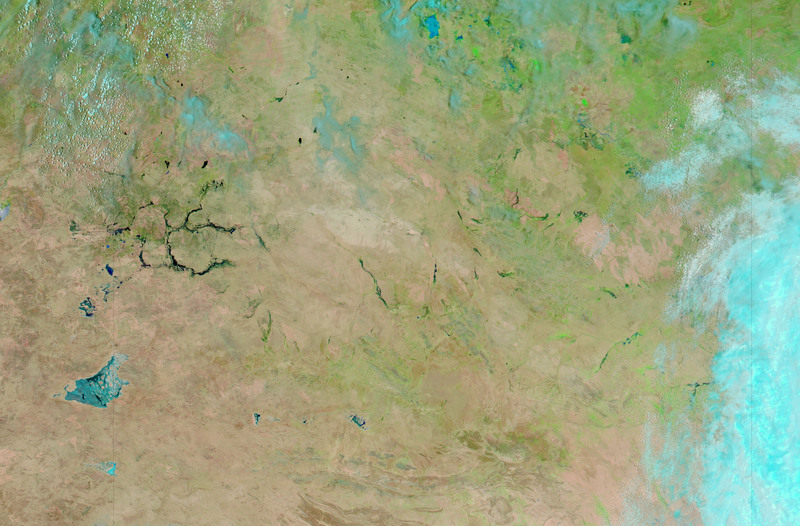 Rivers and creeks that are normally dry channels fill with water during the summer monsoon, and this image shows one such system along the border between Northern Territory and Western Australia, north of a large seasonal lake, Lake Mackay. The image was made with both infrared and visible light so water is black or dark blue. Plant-covered land is green, while bare ground is tan-pink. Clouds are light blue and white. The black water flowing through the river channels and the threads of green that follow the waterways give the landscape a marbled appearance in the top image. The lower image, taken a few weeks earlier on December 31, 2006, shows the region before the monsoon system struck. A brush of green and black pools of water reveal that some rain had already fallen by December 31, but the region did not exhibit the extensive floods that would occur in January. Daily images of Australia are available from the MODIS Rapid Response Team. The summer monsoon brought heavy rain to Australia's desert interior in January and February 2007, leaving normally empty river channels brimming with water. This event includes pre- and post-flood images from Northern Territory and Queensland.